Kite festivalis one of the most popular festivals of India. It is also known as Makar Sankranti in most parts of India. It is one of the most favourable days in Hindu society. Lord Sun is worshipped by the people on this occasion. A number of people take bath in holy river Ganga. It is the day for which Bhishma Pitahmah kept waiting to leave his mortal coil. Kite festival is celebrated with myriad cultural forms, with great faith, enthusiasm and gaiety. In China and Japan, Too, people enjoy flying kites. Now, it's being celebrated through the world. The festival of Uttarayan marks the day when winter begins to turn into summer, according to the Indian calendar. It is the sign for farmers that the sun is back and that harvest season is approaching which is called Makara Sankranti. This day is known to be one of the most important harvest days in India. Many cities in Gujarat held kite competition between their citizens where the people all compete with each other. The Hindi meaning of kite is Patang. 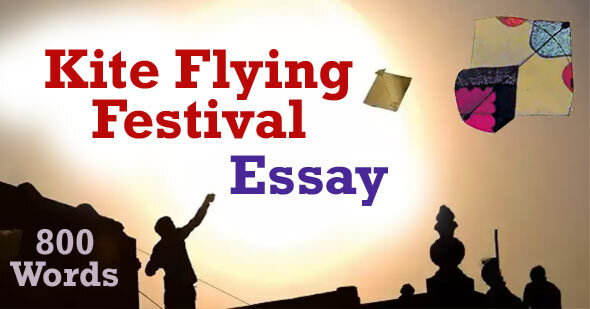 Hence the festival is also referred to as Patang Utsav in India. Patang is also called by another name Guddi in many places in northern India. To fly kites, people use special thread that is called Manjha. These kites are generally made of thin paper and bamboo strips. Plastic Kites are also used. They are very attractive. This kite-flying day is celebrated in our part of the country on January 14. Early in the morning of that day, people of all ages (boys, girls and often grown-up men and women) busy flying kites. They have big reels of string spinning in their hands as the many coloured. If a finger comes in its way, it would be cut badly. On the day of Makar Sankranti, the Sun starts its ascendancy and enter into the northern hemisphere, and thus it indicates an incident wherein the Gods seem to remind their children that “Tamaso Ma Jyotir Gamaya”, means that may you go higher and higher, too more and more light and never to darkness. There is tale why the Makar Sankranti is celebrated all over India. On this day Sun visits the house of his son Shani, who is the swami of Makar Rashi. Both father and son do not get along nicely, but on this day, Lord Sun makes it a point to meet each other. The Lord Sun, in fact, himself visits his son’s house for a month. This meeting of Lord Sun and son Shani has symbolized the importance of the special relationship between father and son. It is the son who has the responsibility to carry forward his father’s dream. It is well known that that Makar Sankranti is also known as kite festival in many parts of our country. Although kite festival is celebrated in all parts of India Gujarat and Jaipur in Rajasthan are more popular for their kite festivals. Jaipur organizes international kite festival annually. Every year, Gujarat celebrates more than 200 festivals. The International Kite Festival (Uttarayan) is regarded as one of the biggest festivals celebrated. Months before the festival, homes in Gujarat begin to manufacture kites for the festival. Makar Sankranti is a popular word in Rajasthan whereas Utran (derived from Uttarayan) is in Gujarat. In Kolkata, kite festival is celebrated on Vishwakarma Puja. On the occasion of this festival, there are kite- cutting matches. A kite swoops down upon another kite. There is a wild clamour of delight. When the two kites get entangled with each other, the strings start sawing each other. Then eventually one of the kites separates and is sent bobbing away. It is cut! Children rush and leap and dance with poles in their hands to get the string of a fallen kite. Kite festival affects the health of people greatly. This festival comes in a winter season. Sun rays are very good for health in the winter season. So, Indian people of all ages take a sunbath in winter. Kite flying is a good way to get direct sun rays. This festival promotes people to go to the rooftops or open grounds to take a sunbath. It entertains the people and strengthens their arm muscles. It is a good exercise for legs and eyes. People wait for this festival for a long time. When this festival comes, the people celebrate this with great pomp and show. This festival brings joy to everybody’s lives. The fun goes on throughout the day. Kites with different sizes, colours and qualities are purchased from the shops and then plely fly them in the sky. The sky looks very nice and pleasant when kites of various colours fly. The sky looks full of colourful birds. It is really colourful. Not only sky but also trees are found ornamented with kites fallen over these trees. These scenes fill the mind with joy and happiness.